management: Is This The End of Tape? In past years there was no choice: mainframe sites needed tape. However improvements in disk and virtual tape technologies today offer ways to run a tapeless mainframe. So is this the end of tape? Tape has always been an essential and integral part of every mainframe environment. From old reel-to-reel 3420s to the current cartridge-based units, every mainframe site has relied on tape. For decades it has provided a cheap, safe, reliable way to store large quantities of backups and archival data, and to transfer data from site to site. In fact until the last few years, the only way to receive z/OS software was on tape. However tape today is less important than it once was. Disk subsystems offer more storage for the same money, and in recent years have become almost bulletproof. Many sites mirror their production disk to remote disaster recovery sites, and virtual tape servers seamlessly store data intended for tape on disks. So are tapes now obsolete? Backups: of individual databases, application data and entire disks. Storing archival data – data that must be retained, but is rarely used. Information transfer – moving data from one site to another. Emergencies – backups on tape can be used to restore a system on a remote site, and standalone utilities residing on tape can be used to recover a failed system. However the importance of tapes in these areas isn't as great as it was. Most sites still perform regular “full pack” backups of their disk subsystems as protection in case of a disk failure. However current disk subsystems use RAID technology and other technical features to the point that disk failures almost never occur. The “head crash” that in the past would kill a disk today is not even noticed. Some argue that such full pack backups are no longer required. Regular backups of application data, databases and database logs are also made in case of application or operator failure. With the decreased cost of disk, these backups could be stored on disk. For those with a remote disaster recovery (DR) site, the cheapest way to restore data at that site is to physically transport tape backups (the Pickup Truck Access Method, or PTAM) and restore from them. However sites with a need for faster recovery can use mirror facilities available in most disk subsystems such as IBM PPRC and HDS TrueCopy. These will automatically copy or mirror the disk contents onto a remote subsystem. The DR site can have up-to-date information stored on already-running disks, ready to be used in the case of a disaster. This technology can reduce the downtime of a full production site disaster to minutes. The cost per byte of disk has continued to plummet over the past years – faster than the decreasing cost of tape. Nowhere has this been faster than in the mainframe arena, where the introduction of RAID systems based on standard low cost SCSI drives in the 1990s dramatically reduced mainframe disk costs. This has been matched by reduced environmental and footprint requirements for disk subsystems (remember the old DASD farms of the 1980s?). So it's now a very real option to store all archival data on disk. To receive software or software updates. To send dumps or other diagnostic information to software and hardware suppliers for problem diagnosis. To send information between companies. Today this is no longer required. Software and hardware vendors all provide a way to download software and software updates, and upload diagnostic information over the internet. Company to company data transfers can be done simply and securely over the internet using TCPIP and related tools available for the mainframe. Both IBM DFSMSdss and Innovation FDRABR have a standalone program that can be IPLed to restore a disk from a backup. New Era Software Stand Alone Environment (SAE) is a utility that can be used to edit datasets and make other changes when z/OS is down. Jan Jaegar has also written a utility that can edit datasets, but this one is free. However once installed, these utilities can also be IPLed from disk. The application writes data to a device. No change required. To z/OS this device is a tape. z/OS sends a write operation to this device. Again, no change required. The device is actually a VTS that is pretending to be a tape drive. The data is written first to the VTS cache and then to disk. Some VTS subsystems include tape subsystem functionality: either as part of the unit or as an external tape library. These systems could subsequently migrate data on the VTS disk to tape, clearing VTS disk space. The application creates a request for data. No change required. To z/OS, this device is a tape. z/OS sends a read operation to this device. Again, no change required. The VTS looks at its internal catalog. If the information is in cache, it is quickly sent to z/OS. If the information is on disk, it's moved to cache and sent to z/OS. If it is on tape, then that tape is mounted, the information copied to disk and cache, and then sent to z/OS. Because cache and disk are far faster than tape, z/OS tasks accessing tape can run much faster. A VTS can 'pretend' to be many tape drives: up to 256 in most cases. No more waiting for idle tape drives. A VTS can greatly reduce the number of tapes required by intelligently stacking information on each tape. Of course some tape management software such as DFSMSrmm and BMC Control-M/Tape can also achieve this. VTS have sophisticated management utilities to control the VTS. This allows users to perform tasks such as creating rules for writing data to tape and creating tapes for offsite storage. VTS have mirror facilities that are similar to disk subsystems. So a production VTS can have a mirror VTS at a DR site. Using a VTS isn't the only option to reduce or minimise tape usage. A budget alternative is to use DFSMSsms to route tape requests to disk, possibly for later (and more efficient) archival to tape using IBM DFSMShsm or Innovation FDRABR. Buying enough disk to hold the entire tape library, copy all tape data to disk, and change the DFSMS configuration (or all JCL) to remove tape reads and writes. An alternative would be to implement a VTS to replace all tape drives with enough internal disk space to hold the entire tape library. Implement mirroring of the production disk subsystems and VTS to a DR site. Make sure that all standalone utilities are on at least one disk, and their location well documented. Implement electronic file transfer facilities for any transfers between companies or organisations. Send all dumps and diagnostic information electronically to software vendors. The big advantages enjoyed by tape have always been cost and reliability. Although the cost of disk storage is decreasing, the amount of data that needs to be stored is increasing just as fast. Megabyte for megabyte, tape remains the cheapest way of storing data – a factor of 10 or so cheaper than disk. With the push for greener data centres, tape wins again. 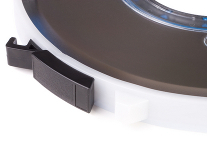 While spinning disks are continually consuming power and generating heat, tapes have no such overhead. Although disk subsystems are very reliable, the possibility of failure is still present. This can be a media failure, subsystem failure (such as a microcode error) or environmental failure (such as a machine room flooding, as happened to Dallas County in the United States a couple of months ago). For essential application and database backups, tapes are still ideal. Sites without access to expensive mirroring facilities can use tapes and PTAM to restore systems at the DR site. Sites with tape can also use their tape drives for standalone utilities – useful for worst case situations, such as when the disk holding the utility is the disk in trouble. Tape media development has by no means ceased, and tape storage densities continue to increase (currently up to 1TByte uncompressed per cartridge). In January IBM, in partnership with Fujifilm, announced a new prototype tape that stores 39 times more data than of today's tape. But perhaps the biggest thing going for tapes is that they give piece of mind. Tape is the most reliable way of storing information. It's much harder to accidentally delete a file on tape, and there's no need to worry about power failures, disk crashes, microcode problems, or network outages. Data on tape can quietly stay in a room at the back for decades (up to 30 years for current cartridges). As anyone who has worked in a data centre knows, tapes require a lot of management. The more tapes, the more management. Many data centres have tape libraries ranging into the tens of thousands – and growing quickly. These tapes quite often move between data centres, and between a data centre and an off-site location. This is all done manually, with the potential of operator error. What's more, tapes won't help if no-one knows what is on them. So tape management software is required, and off-site tapes must have accompanying documentation showing what is where. Regularly replacing older or higher-used tapes. Keeping track of any data errors on tapes. Ensuring high-use data remains on disk. Keeping backups of important tapes. It's also much easier to lose a tape. Late last year Zurich announced that it had lost a backup tape in South Africa holding details of some 51,000 customers and other parties. This shows that tapes must be secured, and preferably encrypted to prevent the data landing in the wrong hands. When migrating to a new tape format, there may be significant work in migrating legacy tapes to the new format. Although current tape libraries all support many older formats, it's unlikely that all formats will be supported forever. Although technically a tapeless mainframe site is possible, it will continue to be the exception for some time to come. With the increased cost and risk involved, most sites will stick to the tried-and-true. Tapes are low-tech, and have far fewer failure points than the alternative tapeless solutions. Having regular, up-to-date backups and archival data on tapes that are well managed and regularly checked will give any manager piece of mind. In many mainframe sites, tape is enjoying a renaissance with data centres under pressure to reduce costs. However options to reduce the size of tape libraries and the number of tape drives will always be appealing. Increased usage of disk for frequently accessed archival data, together with VTS or other technology to intelligently pack and manage tapes will be on the wish-list for many mainframe managers.